Are there significant metallurgical differences in the alloys used in various brands of cartridge brass? The answer is yes, and we have proof. 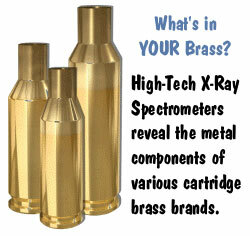 Using a state-of-the-art X-Ray Fluorescence Spectrometer, some tech-savy Wisconsin shooters recently analyzed the alloys in seven different types of cartridge brass. 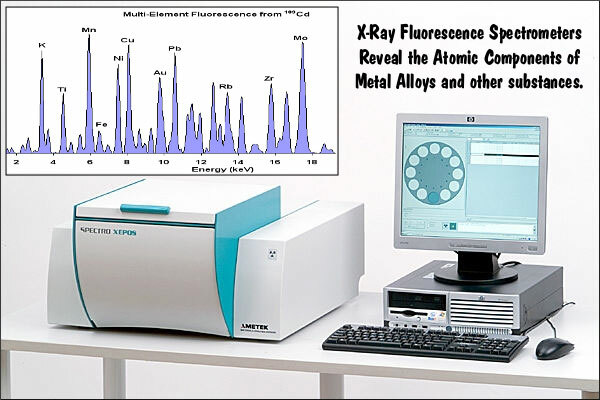 This testing was done at major science laboratory, using high-grade X-Ray Spectrometry Analyzing equipment. Fred reports that: “The data was run by one of the club members with the permission of the test lab supervisor who is also a club member and shooter. The data in original output reports was far more detailed about trace elements at lower orders of magnitude primarily from surface contaminants (some were rerun after establishing a repeatable cleaning procedure)”. The testing process is discussed in this Shooters’ Forum thread. We do NOT have the metallurgical expertise to infer that any particular alloy shown above is “better” than another. The alloy “blend” is merely one of many variables that can have an impact on the performance and quality of the finished product. Annealing times/methods differ and some cartridge brass is extruded while other cartridge brass is made with the traditional drawing process. Readers should not presume, on reading the above chart, that they can identify the “best shooting” brass simply based on the constituent metals in the various alloys. 1. The range of Copper/Zinc ratios suitable for use in cartridge making by typical processes is 85/15 to 65/35 (% by weight or mass). 3. As the percentage of zinc increases, the tensile strength, yield strength and hardness tend to increase. However, above 35% zinc, while tensile strength will continue to tend to increase, both yield strength and hardness will tend to begin to decrease. 4. The trace additives of iron and/or silicon are used to control the processing characteristics of the alloy. Trace additions of chromium will improve corrosion resistance and give a shinier surface (both largely cosmetic). 5. Selection of the alloy and additives is a trade off among: end use desired properties; processing time and yield; and cost of materials. For example, the classic 70/30 cartridge brass was considered an optimum combination of corrosion resistance and hardness for single use by the military with good process yield at acceptable material cost. 6. All of my responding experts were surprised by the brown box Lapua alloy except for the oldest. He remembered using an almost identical alloy late in WWII when copper was in very short supply for military small arms ammunition. Share the post "Cartridge Brass Alloys Revealed by X-Ray Spectrometers"
If you’re looking for a Nightforce 12-42×56 Benchrest model scope with a CH-series reticle, you may want to act soon. Nightforce is reducing production of these models and the limited runs will be strictly earmarked for Nightforce’s most active dealers. (NF Benchrest scopes with other reticle choices will continue to be widely available). Nightforce’s CH (i.e. cross-hair) reticles, are offered in three versions: CH-1 (fine cross-hair), CH-2 (fine cross-hair with 0.2 MOA inscribed dot), and CH-3 (fine cross-hair with 0.2 MOA “floating” dot). The CH reticles have always been popular with benchresters, as they provide an unobstructed view of mirage and windflags. The CH-2 reticle has been used by the USAMU for long-range and High Power competition. The CH-3 includes an open area around the 0.2 MOA dot, which makes the dot easier to see on dark backgrounds. On the CH-3, only the dot can be illuminated. The CH-series reticles are no longer offered in the lower-power 8-32×56 BR model at all. If you want a CH reticle in a NF Benchrest scope, you’ll need to order the 12-42×56 scope. AND, you’ll now need to order from a major stocking dealer. EuroOptic.com currently has one of the largest inventories of 12-42×56 BR Nightforce scopes with CH Reticles — it has about 50 of these CH reticle Benchrest scopes in stock. To order, call (570) 220-3159, ask for Jason Baney and mention that you heard about these CH reticle scopes through the Daily Bulletin. Jason will make sure you get the right CH reticle version at the best possible price. 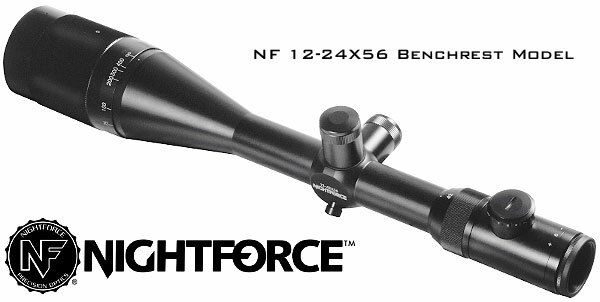 Another large stocking dealer of Nightforce scopes is D&B Supply, found on the web at ScopeUsOut.com. Share the post "Nightforce News: CH-Reticle Benchrest Scopes Availability"
Later this month, GLOCK, Inc. will donate a total of $75,000 to two organizations, the Young Marines and the Marine Corps League. 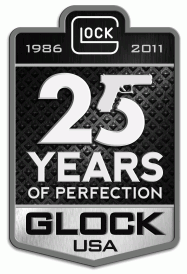 On Wednesday, Sept. 28th, Glock V.P. Josh Dorsey (a former Marine) will present $50,000 to the Young Marines and $25,000 to the Marine Corps League during a presentation held at the Iwo Jima Memorial, Quantico, Virginia. This will be the sixth consecutive year that Glock has made this contribution to the Young Marines totaling $300,000. The Young Marines is a nonprofit youth organization whose mission is to provides programs for youth that promote mental, moral and physical health through teamwork, self-discipline and a drug-free lifestyle. The program strives to instill core values of “Honor, Courage and Commitment” adopted by each member of the Marine Corps. This is the second year that Glock has made a contribution to this organization. The Marine Corps League is comprised of retired Marines volunteers who render assistance to all Marines and former Marines and to the families of fallen Marines. The group actively supports injured Marines, and assists youth programs. The League takes an active role in Veterans benefits issues and helps with the National Marine Corps Museum. Share the post "Glock Donates $75K to Marine Corps Service Organizations"